The Toshiba WB02-KIT5-50 has been discontinued. No direct replacement is available. 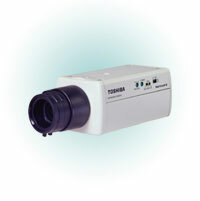 The Toshiba WB02-KIT5-50 IP Network Camera uses both network video out to connect to recorders through RJ 45 connections and analog BNC output to connect to standard CCTV monitors and recorders. With the SD card slot, a convenience store owner or smaller retailer can have an all-in-one recording solution by purchasing an SD card and record on motion activity at the camera. After an incident, simply take out the SD card and play it back on a computer to view captured video at 1 frame per second.